Yep, that’s right folks, this week our ten thousandth candidate hit the submit button on an application to a job via Applied! We felt this called for a celebration. And since we’re a dorky bunch, to celebrate we’re going to share some data with you. Or more to the point, share some data that we deliberately don’t share with review teams when they’re are making hiring decisions. (my personal favourite) the collective noun for 10,000 birds is a … blog! What can we say about our 10,000 fearless candidates? Now, onto the meat of it. We obviously run a tonne of analysis on all kinds of interesting questions like which questions work best and for whom, and who’s applying to jobs. But for this post, we thought we’d present some of the quirkier things we’ve discovered about the candidates themselves. More specifically, the thing that tonnes of research tells us people pay attention to when reading CVs but shouldn’t: candidates’ names. Finding #1: The Goldilocks of lengths? It turns out there’s quite a lot of variation in the length of people’s names — the shortest we had was 2 letters for a first name and 3 for a second: nice and snappy. 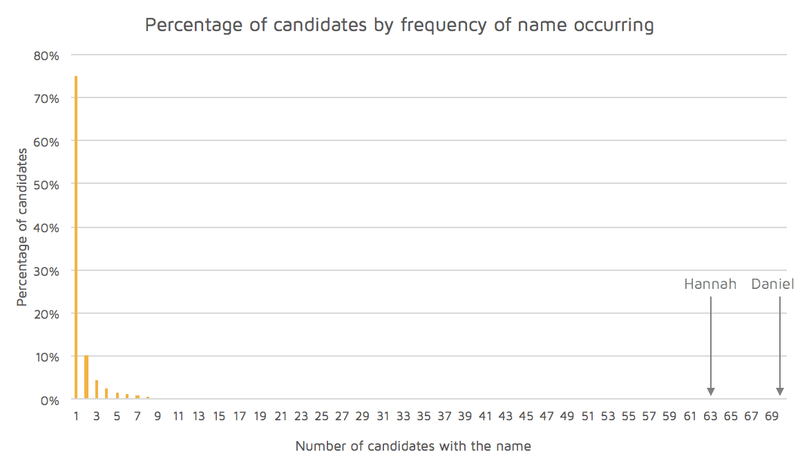 By contrast, one candidate had no less than 30 letters in their first name alone, and another had 29 in their surname! The longest combined length of a first and last name was a whopping 39 letters. I’m sure that person has a lot of things to say about forms with boxes. 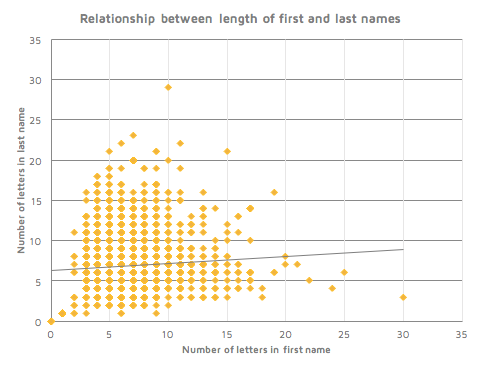 On average we found that most people’s parents seem to have taken the Goldilocks approach: the most common length of a first name is 5 letters, and a last name is 6. As you can see in the scatter plot above, there also doesn’t appear to be much of a relationship between the length of first and last names. Possibly because kind parents try to compensate for a long last name with something a little more digestible for the first. Finding #2: What do Adam Smith, Amy Schumer, and Ariel Sharon have in common? Not all that much, so far as we can tell. Except for the fact that their names start with the letters we found were most common for first and last names: A and S. As you can see below, more than 1 in 9 of our candidates has a name that starts with an A. In fact, you’re about three times as likely to have a first name starting with A than any of the last six letters of the alphabet combined. 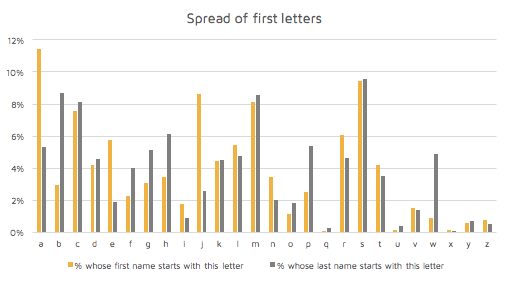 We wondered if this might be a strange manifestation of a curious research finding — referred to as the ‘name letter effect’ — that people tend to prefer things that start with the first letter of their first name. Some research indicates that your name can shape everything from your preferences for soft drinks to where you choose to live (Philippa’s being more likely to prefer Pepsi and live in Philadelphia). Maybe Applied is doing a good job of attracting Adam, Anisha and Aubrey to jobs merely because we share the same first letter? While imperfect, to test it we compared our frequencies to those we might have expected looking at the most common baby names from 1984 and 1994 using ONS data (this being a rough proxy for our underlying candidate population, which skews to being in their early-20s to early-30s and British). 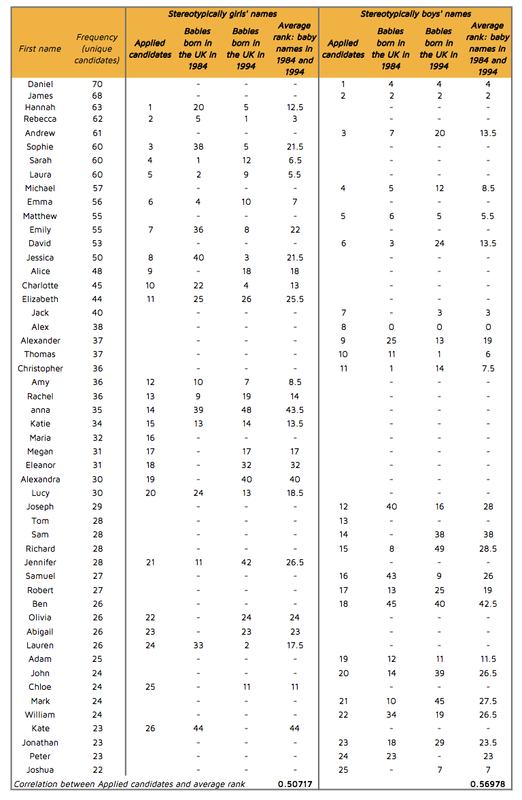 Of the top 50 most common boys’ names in those years, 10% start with A, and of the most common girls’ names, just 9% do. Our overall rate is 11.4%, higher for sure, but probably not worth writing an academic article about (at least not yet). The most common name for a male candidate in our sample was Daniel, and for a female it was Hannah. Both relatively common names, but we found that our candidate pool isn’t actually as ‘typical’ as we might have expected. The bulk of the most frequently-occurring names in our candidate pool were traditionally Anglo-Saxon names like James, Andrew, Laura, and Sarah. But when compared to how popular they are, we saw some differences. Amongst this group, we actually have far more Sophie’s and far fewer Chloe’s: the former you’d expect to rank about 22nd, but in fact ranks 3rd, the latter should be about 11th but is in fact 25th. Similarly, we’ve got a disproportionately high number of Joseph’s and relatively fewer Joshua’s. Overall, there’s a solid, but far from perfect, correlation between the ranking of names in our candidate pool and their rank in the general population — just 0.5 for females and 0.6 for males. But actually all this kind of masks the more interesting fact that a whopping 75% of our candidates had unique names! Controlling for repeat applications, 70 fantastic Daniel’s and 63 equally amazing Hannah’s applied to jobs through Applied. But that’s actually not that much in the context of over 10,000 applications. As you can see below, you’re far more likely to have a name no-one else has than a common one: Daniel’s occur at a rate of just 0.3%. And comparing this to population data, it seems our candidate pool is significantly more diverse (in name, at a minimum) than you’d anticipate. For example, while the overall distributions of boys’ and girls’ names show a similar distribution to ours above, they’re far less extreme (see data here). Of the 300,000-odd girls born in 2013 for example, just 1,797 have a rare name (measured by sharing it with only one or two others). According to the ONS, boys are even less likely to have a unique name. Even the name ‘A’ was given to 7 young gents in that year! A few months ago, on a particularly wonky day, Kate made the (self-professed) radical discovery that her and her cofounders shared a strange feature: each of their names started and ended with the same letter (T for Theo Fellgett, R for Rich Marr, and K for Kate Glazebrook). Where better to find out than using a hefty 10,000-person sample? With the help of researcher extraordinaire, Janna, we discovered that this quirk was indeed notable. Just 0.16% of all our candidates shared this same feature with us. What this means is that there was a (0.0016)³=0.000000004% chance that we should have founded a company together — assuming that this trait has no relationship to propensity to start up a company. In fact, the chances of us forming a team was less likely than the chance that one of would win the lottery! (Which, in case you need any more proof that your pennies are better off being spent elsewhere is apparently a measly 0.00000002%, or 1 in 54 million). We hope you found our random musings about the curiosities about names interesting. But you’d be pretty worried if we were doing anything other than writing the odd blog about this stuff, right? What all of this data shows is that while names might hold an intrinsic interest to us as humans, they’re pretty unhelpful for making important decisions like who you want to be in your team. So for that reason, and because a tonne of research supports blind review, we’re proud to help organisations make hiring decisions without the distraction of a name or other features we think can just get in the way. And that’s why we weren’t worried when our first hire, Diana Lee, didn’t share our irrelevant — if improbable — quirk. This blog is dedicated to the 10,000+ candidates that have applied to jobs for organisations we’re partnering with: power to you. Kate Glazebrook is co-founder and CEO of Applied, a SaaS platform that increases hiring precision and reduces bias.